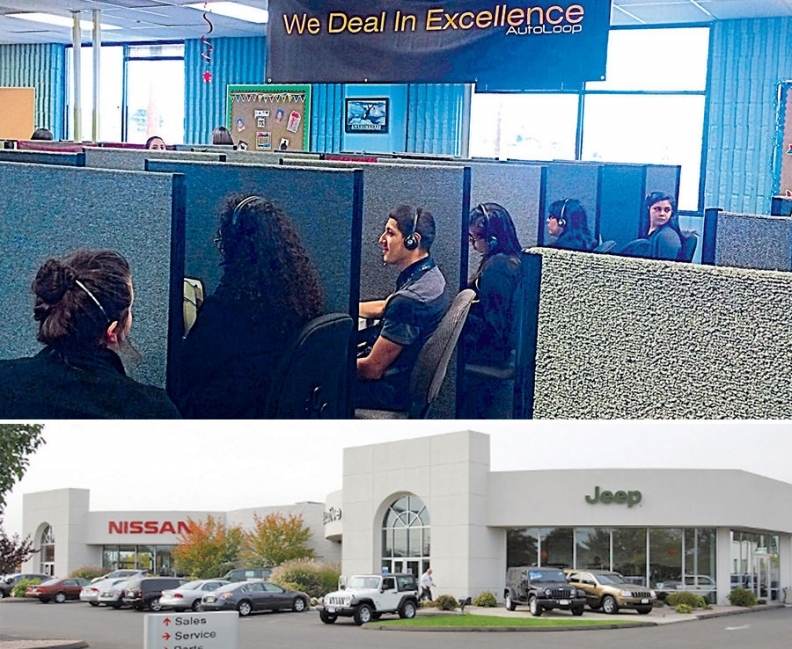 The operators at AutoLoop's call center in Houston, top, schedule service appointments and answer simple questions for customers of Executive Auto Group's dealerships in Connecticut, above. That lets service employees work uninterrupted. Business has been good at Executive Auto Group's service departments lately. In fact, it was almost getting too good. Customers were phoning in to schedule service appointments at such a volume that shop advisers simply couldn't get to all the calls as fast as they wanted. "You hate to admit it, but we were letting business get away from us," says Gary Gargano, director of fixed operations for the Wallingford, Conn., group with nearly a dozen dealerships. Executive resolved the problem by running its phones through a third-party call management service provided by AutoLoop under the name Engage. All incoming service calls now are routed to AutoLoop's off-site call center in Houston that is connected back into Executive's garages. Customers can get questions answered, make service appointments, obtain repair information or check on the status of a job. "We monitor our call activity, and we saw that there were a lot of missed opportunities," Gargano says. "Calls weren't being picked up in a timely manner. Calls were getting dropped, and calls were going into voicemail. Every phone call we miss is missed revenue. Maybe somebody just wanted to come in for an oil change, and we didn't get back to them." Inside Executive's garages these days, it is noticeably quieter, employees say -- except for the sound of work in progress. The off-site center handles scheduling but also takes care of simple questions: Is the shop open on weekends? Do you have this or that size tire in stock? Is somebody available today to look at my brakes? If it is important to the caller, the center still cheerfully will put the customer through to a service adviser or technician with a specific issue. But even when those requests are made, the call center operator will make one more attempt -- offering to put the caller on a brief hold and obtain the answer instead, thereby limiting the amount of time the technician's work is interrupted. "We're not pushing customers away," Gargano emphasizes. "We're just making sure that they get through to us in the first place." It is not unusual anywhere for dealership customers to phone a busy service department and not get an answer. Calls go into the voicemail of a hectic service manager who might not get to it before the day ends. "This wasn't about increasing our revenues," Gargano says, "even though that's happening. Our productivity is up because we're not having to stop and answer the phone all the time. "But what it's really about is improving our customer service. Everybody's filling out a survey on you these days. Somebody calls to see if their car is ready and you can't get to the call -- that's an unhappy experience for them." Service departments continue to get busier as new-car sales volumes grow. The average U.S. dealership reported service and parts department sales of $2,901,891 for the first six months of this year, an increase of 5.6 percent from the year-earlier period, according to National Automobile Dealers Association data. "If we can get our people off of the phones, it frees them up to spend more time with customers in the shop," Gargano says. "Customers want to be pampered. We do a complimentary multipoint inspection. We need time to go over their car with them and explain everything." Keith Shetterly, AutoLoop's vice president of Engage, says his company has been developing the service department concept for the last year and a half and stepped up marketing it early this year. Service department operators are trained for two weeks before going live with customers. They are not expected to be automotive experts, but they learn the lingo of the business and how service departments work. "We don't generate calls for dealerships," Shetterly says. "We just manage the business they already have coming their way. Our research indicates that the average dealer is probably losing about 20 percent of its incoming callers." If the dealership requests it, call center operators also will perform soft upsell services. If the store is offering a special on oil changes or having a sale on tires, the operator will mention it. Or callers can be asked whether they'd like to have the technician examine the vehicle's air conditioning during the visit. Gargano says his managers have a conference with the Engage operators every week to go over various issues. The communications are daily when it comes to weather. "We'll call and tell them that we're in the middle of a snowstorm and tell them that we'll take care of anybody whose car won't start," says the Connecticut manager. "We want to have a nice, even schedule of appointments, of course. But when it comes to taking care of people, we want to remind the call center not to run anyone away."